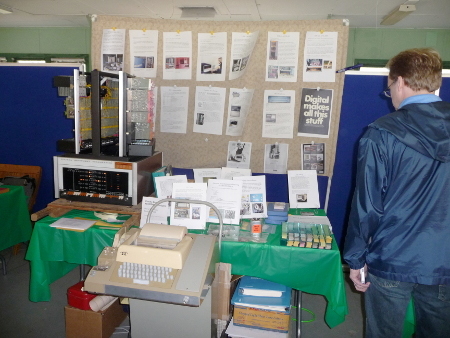 The retro computer hobbyist group MARCH hosted the Vintage Computer Festival East 2015. In the 60's and 70's a New Jersey high school computer club called the RESISTORS used several computers. One of them was the original model of DEC PDP-8. They used it from 1969 to early 70's. That computer was donated to the MARCH museum in 2008. It needed significant restoration which is discussed here. I didn't have much time to prepare demos so used a block letter paper tape punch program and luner lander game running in the FOCAL language. It takes the computer 13 minutes to load FOCAL and another 3 minutes to load the game. When loading from a Teletype you have to have patience. The reader on the Teletype wasn't 100% reliable so I actually loaded from a modern computer. Information on Claude Kagan who mentored the group for much of its existence. Other sites with pictures of the event.